Whisking ourselves away for an adventure any time the mood strikes is ideal for us. With no kids at home, no pets and no killable plants, this phase of our life is all about new experiences and adventures. This is why we planned a last-minute getaway to Wilmington and its beaches, an area we’ve visited often. There’s so much to see and do; it requires multiple trips. Our choice of the comfy Front Street Inn allows easy walking access to downtown and a savory homemade quiche from innkeeper Polly each morning. Fall is an especially great time to visit. It’s less crowded as schools reopen—giving the beaches plenty of elbow room—and accommodations switch to “off-season” rates, yet mild Southern weather beckons. Day 1: Meat-eating plants, oh my! Morning: First up is a hike at the popular, 761-acre Carolina Beach State Park—after all, it is the 100th anniversary of North Carolina state parks system. 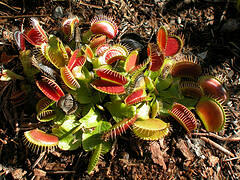 The Wilmington area is one of the only places in the world Venus flytraps grow, so we’re pumped to see them! Because of their diminutive size and woody bog habitat, they’re not always easy to spot, so we take one of the ranger-led Carnivorous Plant Hikes. We marvel at the first sighting, squatting for a better look at the plant’s green spiked leaves. The inner pink inside attracts bugs to devour. Other meat-eaters on the trail include pitcher plants and bladderworts. For hiking on your own, the flytrap trail is marked on a park map available at the visitor’s center. Afternoon: We explore the 250-acre Greenfield Lake, steering our shiny, red-flecked paddleboat past shorelines. Dripping Spanish moss trees wave in the breeze as we scan for wildlife. Evening: Hungry, we limit our window-shopping as we walk along Wilmington’s Riverwalk on the Cape Fear to our reservation at The George waterfront. The waterside view is just as scenic as the food is delicious. Featuring fresh local seafood, the parmesan-encrusted sea bass and sesame crusted black-and-white tuna hit the spot. Morning: The nature theme continues today with rented bikes to explore the recently completed Gary Shell Cross-City Trail. It’s a 15-mile trail connecting Wade, Halyburton and Empie parks, and ending at the Heide-Trask Drawbridge at the Intracoastal Waterway. We leisurely pedal the multi-use path, getting occasional friendly hellos from fellow joggers and walkers. But most of our ride, we’re surrounded by the stillness of the area around us. As we inhale the slightly salt-tinged air, we notice how tall pines create dapples of sunlight around us. Scenic and serene, with just the right amount of adventure, this is what fall feels like in Wilmington. 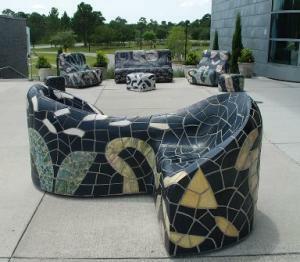 Afternoon: We end our bike ride at the Cameron Art Museum, where a friend has recommended the exhibit Unbound Narrative. The exhibit uses the book as the artistic medium and inspiration for visual narrative. As writers, we couldn’t miss this. After our walk-through, we meet our friend for lunch at the airy CAM Cafe with floor-to-ceiling glass that allows a window-to-woods view. After an early afternoon of art, we’re ready for a dose of adventure. Our surf-fishing lesson at the North Carolina Aquarium at Fort Fisher, in nearby Kure Beach, offers tips on proper form for casting from the beach into the Atlantic. While we fail to land a fish, just being on the expanse of sand with the sun on our faces delights us. Inside, nearly everyone’s pressed close to the aquarium’s two-story “open ocean” tank. It’s feeding time. A diver talks to the crowd via a microphone. He describes some of the creatures swimming by—fish, sharks, rays and Shelldon, the turtle. Evening: We snag the last two seats for a dinner show at TheatreNOW, which has adapted works by local authors, including a couple of our favorites—Clyde Edgerton and Celia Rivenbark. The book author of tonight’s adapted show is attending, so we go over to say hello and congratulate him. 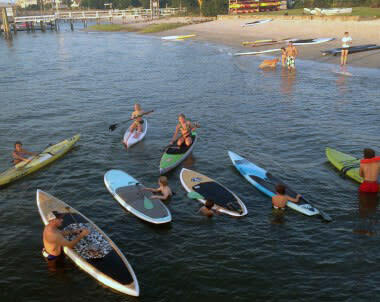 Morning: Morning starts with this trip’s highlight: our first stab at standup paddleboarding (SUP), which looks daunting; yet our enthusiastic instructor at Wrightsville Beach’s Blockade Runner’s Surf to Sound Academy gets us both vertical fairly quickly. (Bragging rights to Kathy who never falls.) Hint: Try SUP weekdays when boat traffic is lighter. Their wakes can wobble your board beneath already wobbly legs if you’re a beginner. Wrightsville Beach was actually named one of the top surfing towns in the world, so there’s no better place to try a new watersport. Afternoon: We lunch at Bluewater Waterfront Grill overlooking the busy Intracoastal Waterway, imagining where the plethora of passing boats are headed as we share bites of the Asian tuna wrap and the oysters blue with crab dip. With a delicious meal under our belts, it’s time for something active again. We’ve sampled several Segway tours and are excited for this one, knowing we’ll cover much more of scenic downtown Wilmington quicker than on foot. Plus, it’s a blast to navigate these motorized two-wheelers. We cheer on the newbies during training, and soon we’re all whizzing along the waterfront and posing for photos with the Battleship NORTH CAROLINA (consistently ranked one of the most popular attractions in the state) in the background. During previous visits, we’ve enjoyed guided tours of the ship, which is considered to be one of the world’s greatest sea weapons. Back at our inn, over a glass of wine before dinner, we meet a half-dozen octogenarians who get together in a different city each year. (At check-in, Richard, the other half of the innkeeping couple, confided we were his youngest guests, which made us laugh). Evening: We love to swap tips with other travelers, which we do over a dinner of duck confit and trout Caroline at the French Caprice Bistro. Getting to know our fellow adventurers makes for a richer travel experience, and we love that. Our meal is excellent, but we are looking forward to our after-dinner plans, too. Like Segways, ghost tours are another of our go-to’s. Wilmington, thought to be one of the most haunted cities in the world, offers several. One particular tale tonight tantalizes our imaginations: The deceased Ms. Love has been so persistent in having a fire to warm her wintertime bedroom that she’s supposedly caused many buyers of her fixer-upper to soon become sellers. Fans of spirits and apparitions should consider planning a Halloween trip to Wilmington. As we load the car, we’re already discussing next time’s to-do list: Zeke’s Island Reserve to see shorebirds and a boat trip to Masonboro Island Reserve. Maybe paddleboard yoga, or, if we get up the nerve, even a lesson at the Carolina Beach surf school famous surfer Tony Silvagni runs. Sound like a summertime thing? 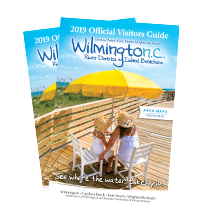 No worries: we could easily spend a week exploring Wilmington and its beaches in all four seasons. Request a free visitors guide to plan your soft-adventure-and-more getaway.